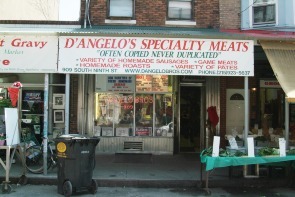 The shop was founded in 1910 by Santo D’Angelo, an expert butcher who immigrated to Pennsylvania from Sicily. Now the shop is owned by D’Angelo’s son, Santo II, and his grandson, Santo III “Sonny.” Sonny continues a tradition that spans over three generations and two families of selling quality game meats, sausages, paté, and other specialties. In his book of family recipes and stories, And Now We Call It Gravy, Sonny recounts how his grandfather originally settled in Downingtown and opened his first butcher shop there at the age of 16. However, the Italian method of cutting meat was very different from the German and Dutch styles, and the business faltered. So Santo came to South Philadelphia, where he could sell his cuts to fellow Sicilians and Italians from other regions. Sonny remembers his grandfather going to the stockyards at Washington and Grays Ferry avenues for goats, lambs and pigs to butcher and sell. Inside the shop, the walls are adorned with animal skins and furs, reflecting D’Angelo Bros.’ tradition of selling fresh game meats. One of Santo’s wholesale clients was Anthony Viso’s butcher shop at 9th and Ellsworth streets. Anthony’s daughter, Theresa, married Santo’s son, Santo II. The Viso family shop closed in 1972.